Join us to learn more about early childhood development milestones and ways to prepare and support your child for the exciting year of Kindergarten. 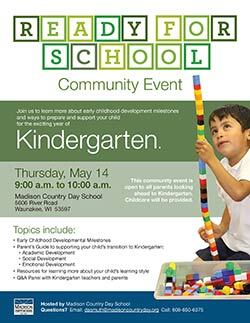 This community event is on Thursday, May 14 from 9:00 to 10:00 a.m. and is open to all parents looking ahead to Kindergarten. Childcare will be provided.